This New Tucson AZ Listing is at 1798 E Pusch Wilderness Dr in the gated community of La Reserve is in the heart of Oro Valley, AZ. 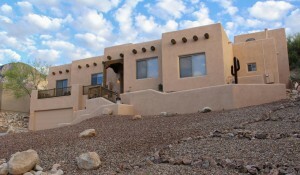 This new Tucson AZ listing is a custom built Santa Fe home that sits high on a ridge just outside the Catalina National Forest. Stunning views of the Oro Valley lights, Tortollita Mountains and THE Pusch Ridge view of the Catalina Mountains surround you. Enjoy living in a home that captures the essence of the SW with Vega beams, beehive fireplace, and authentic Mexican & saltillo tile flooring. Had a hard day golfing? Take a dip in the spa, relax and be captivated by the Pusch Ridge mountain views. Tired from a long day shopping, use the dumbwaiter to bring your treasures into the home from the 3 car garage. To end that busy day, enjoy ALL the updated features in the master bath followed by a cocktail on the front patio deck while another glorious sunset captures the reason why you bought this home! Driving directions – From the intersection of Magee Rd and Oracle Road, go north on Oracle Road to La Reserve Drive. Go east (Right) on La Reserve Dr. to E. Pusch Wilderness Dr. (about 1/4 mile) Turn Right (north) and proceed to staffed gate. The gate staffed from 6 AM to 6 PM, so schedule accordingly. Interested in showing after 6PM, give us a call – 520 – 940 – 4541 and we will make it happen. Questions about this home or other homes listed in the TARMLS and Oro Valley Homes for Sale? Call Us 866 316 5575 OR complete the CONTACT FORM and we will get right back to you! Are you interested in receiving daily emails on new listings and homes with price reductions that meet you specific criteria? If so, we can do that for you.